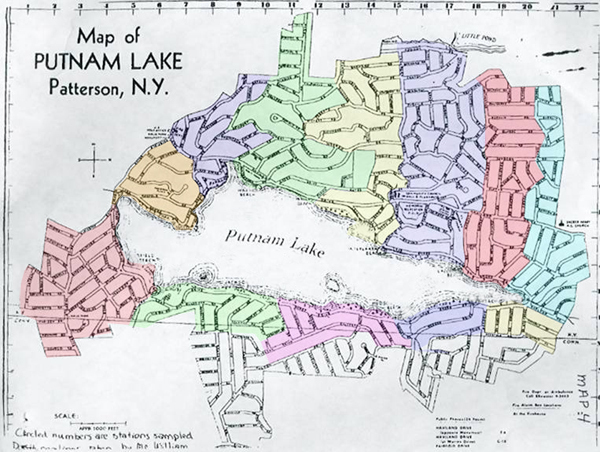 Original map of Putnam Lake defining the properties with deeded rights to use the lake and facilities. The Putnam Lake Park District was established for the benefit of Putnam Lake residents when a community petition was presented to the Town of Patterson in 2011. All facilities and services, use of the lake and parkland are now reserved for residents owning or renting homes within the district. The boundaries of the district were determined by the properties that have deeded rights to use the lake. The title to parkland property previously owned by the PLCC has been transferred to the Town of Patterson for all the district residents to enjoy. The Patterson Town Board approved a new section of Town Code for the district and has appointed a Park Advisory Board to assist its management.